Oil that is — black gold, Texas tea. Well the first thing you know ol’ Jed’s a millionaire. So they loaded up the truck, and they moved to Beverly. 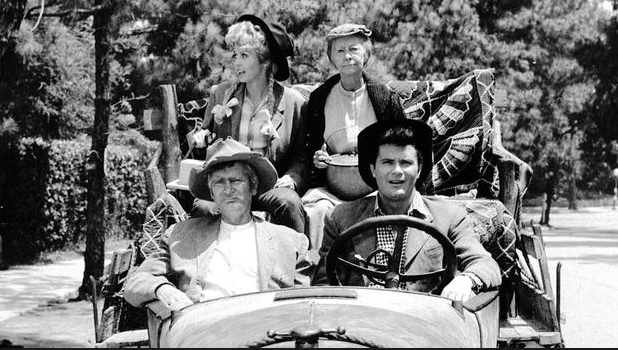 Yes, having accidentally shot his way to a gusher, Jed Clampett took Ellie May, Jethro and Granny to Beverly Hills … where, of course, hijinks and hilarity ensued. The show somehow lasted from 1962 to 1971, and it wasn’t long after the plug was (mercifully) pulled that finding oil had become a challenge that couldn’t be solved by a hillbilly shooting into the ground. 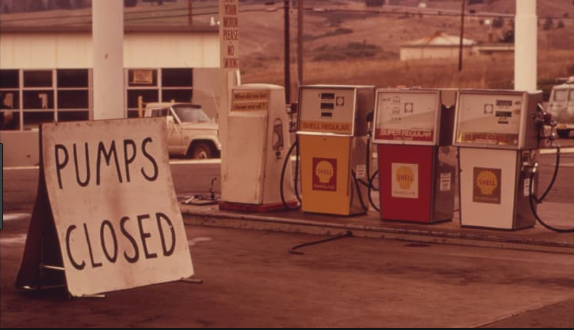 Domestic production waned and reliance on Middle East oil increased, so when the Organization of Arab Petroleum Exporting Countries imposed an embargo on Israel’s allies after the October 1973 Yom Kippur War, the result was a severe shortage in the United States. Gasoline was rationed, prices went up significantly, and when gas was available at all there were long lines at the pumps. By the following decade, demand fell, supply grew, prices went down and the “gas crisis” became a distant memory. 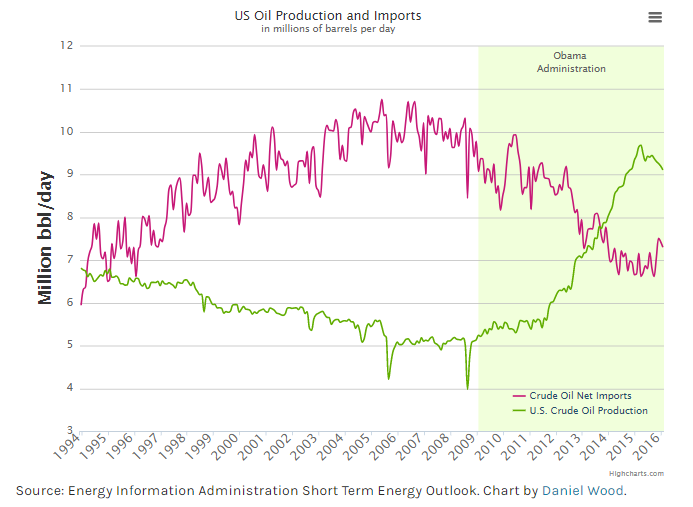 Nonetheless, there remained forecasts that the United States would face similar crises in the future because oil would become too difficult to find domestically, meaning America would again be too beholden to Arab nations. Thanks to companies such as Chevron (CVX) and Exxon Mobil (XOM), however, those dire prognostications didn’t prove to be true. Using innovative technological advances, those and other major U.S. corporations have helped America produce more oil than it imports. Throw in the fact that these companies also have become adept at extracting natural gas from the earth, and I’ve been willing to make personal investments in both CVX and XOM the last few years. Why should I have all the “fun”? 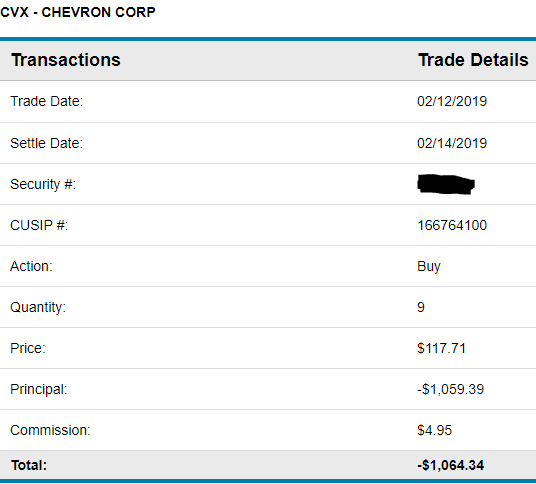 On Tuesday, Feb. 12, I executed a purchase order on Daily Trade Alert’s behalf for 9 shares of Chevron stock. DTA’s Income Builder Portfolio paid $117.71 per share, for a total price of $1,064.34 (including commission). The price of oil goes up and down. 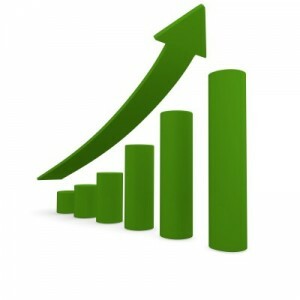 The price of CVX stock goes up and down. 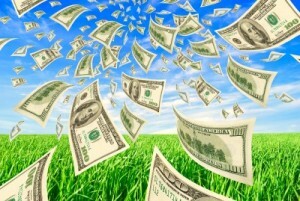 Chevron’s dividend? For more than three decades, that has only gone up. 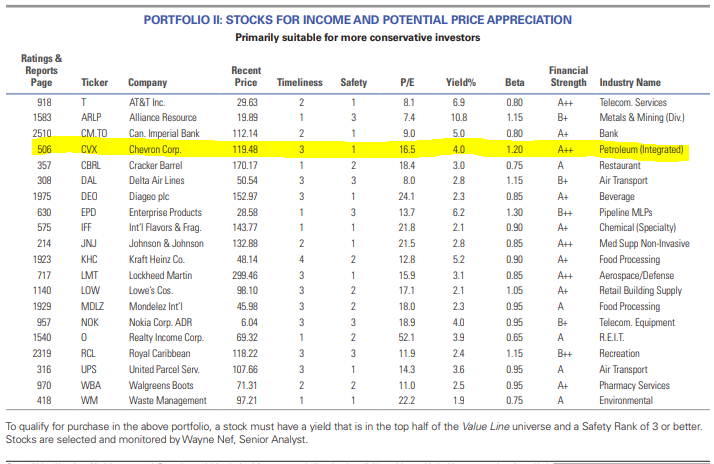 My previous article explained some reasons I chose Chevron for the IBP, and the growing dividend was high on the list. Nevertheless, Chevron’s successful efforts to reduce debt and strengthen its balance sheet let CVX raise its payout 6.25% for 2019, to $4.76 per share. 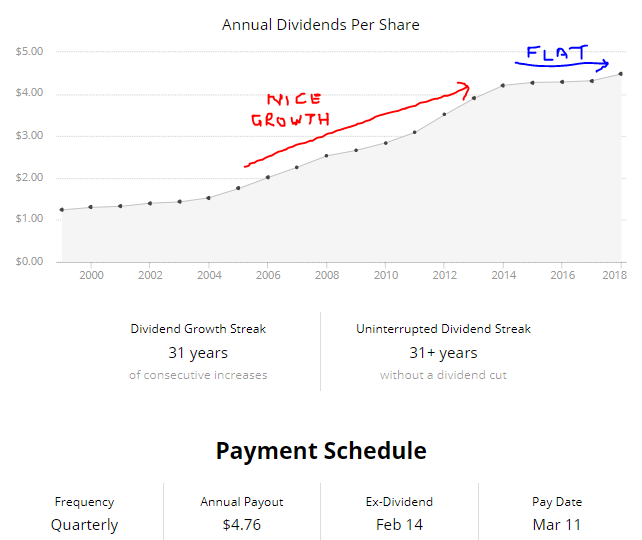 Because our purchase took place before the Feb. 14 ex-dividend date, the Income Builder Portfolio will receive $10.71 (the $1.19 quarterly payout, times 9 shares) on March 11. That will be reinvested right back into CVX stock, as mandated by the IBP Business Plan, bringing an additional .09 of a share into the account if the price remains in the $118 range. Then, come June, the new share total of 9.09 will generate $10.82 in income, which in turn will buy another fraction of a share. The process will get repeated over and over again — not just for Chevron but for each of the 24 positions — which is why we think this endeavor is aptly named. 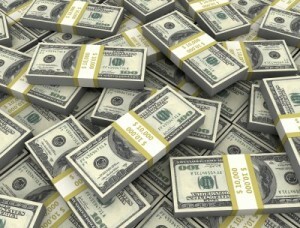 Chevron’s oft-stated commitment to its dividend is only good if the company can keep paying it. Simply Safe Dividends says that shouldn’t be a problem because the combination of growing free cash flow and falling debt makes it highly unlikely that CVX will have to cut its payout. As seen below, SSD gives Chevron a solid “safety” score of 83. 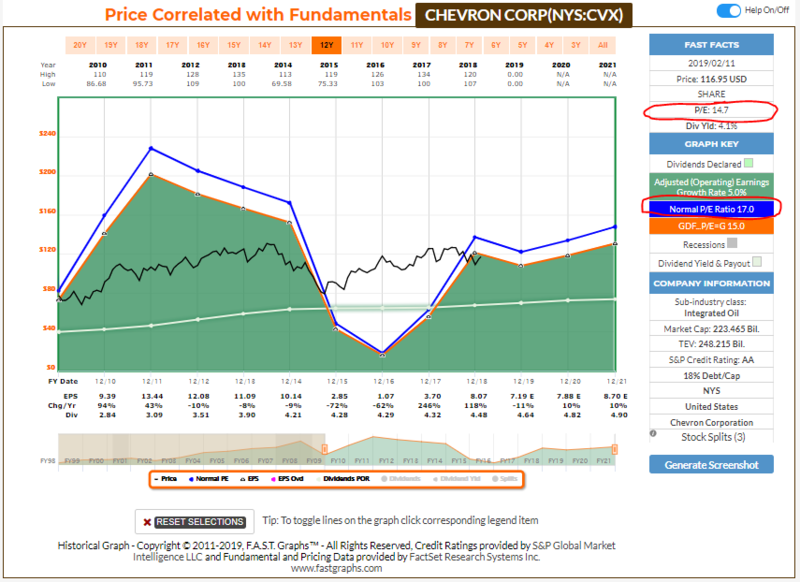 Generally, analysts have a favorable opinion of Chevron. 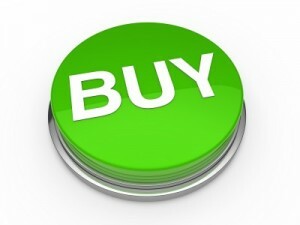 For example, 18 of the 23 surveyed by Thomson Reuters consider CVX to be either a Strong Buy or a Buy. CFRA’s analyst believes Chevron could fetch a price of at least $130 in the next year. Schwab expects Chevron will outperform relative to other stocks out there. 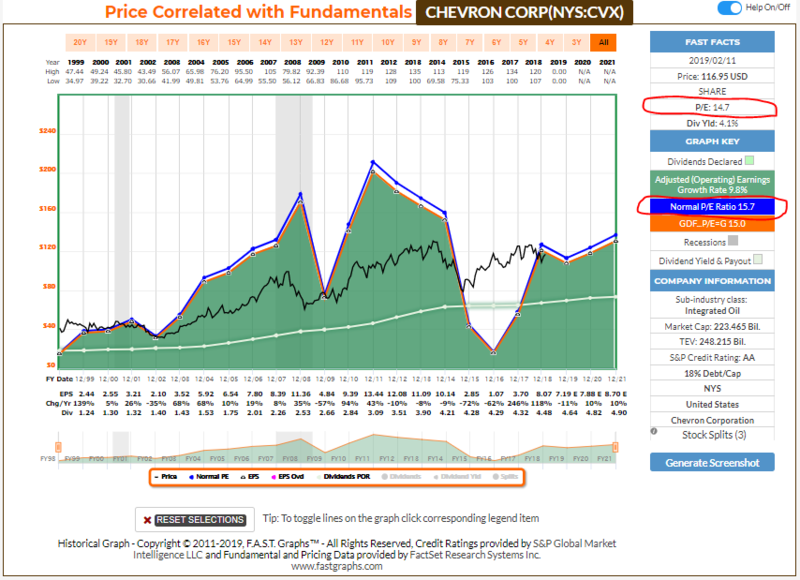 The two FAST Graphs images that follow indicate that Chevron is trading at a low price/earnings ratio compared to both its 20- and 10-year norms. However, it isn’t always easy assessing valuation of oil companies based upon historic P/E ratios because these are among the most cyclical businesses. A relatively low P/E ratio could mean that earnings are nearing a cyclical peak and that growth will not be sustained. Or it could mean that, yes, the company is a relative bargain. So I do like to hear what analysts have to say. For their part, the folks at Morningstar believe Chevron is undervalued by about 15%. They have given the stock a $136 fair value (as noted above), and they list the company’s PEG ratio (price/earnings to expected 5-year growth) at 1.5 — much more attractive than Exxon Mobil’s 3.7 PEG. Just a few years ago, I was reluctant to make a long-term investment in the oil industry. Although I’m still not thrilled with the commodity’s price volatility, I do believe it will be available and widely used for years (or even decades) to come. Obviously, I am comfortable enough about the situation to own CVX in my personal portfolio — and now to have selected it as the IBP’s first investment in the Energy sector. And I reached that comfort level even without having unearthed any bubblin’ crude while shootin’ at some food.